More well known titles from the NeoGeo era are revived for home consoles. 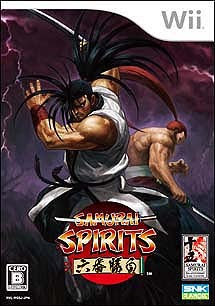 Samurai Spirits chronicles that marks a turning point in the development of hack and slash fighters is converted for the PlayStation2? and Nintendo Wii?. In addition to the old fun, this Online Collection version contains a lot more other elements which fully utilize the facilities of the PlayStation2? and Nintendo Wii?. And in addition to this, the collection comes with a bonus game called Samurai Spirits Tenka Ichi no Kenkaku den. Both PlayStation2? and Nintendo Wii? versions feature a color edit system that allows you to change your player character's outlook and two sets of background music for you to listen to. Aside from these audio and visual additions, the system is upgraded with a VS mode where you can repeatedly fight a character until you are satisfied with your scores. Another upgrade is the training mode where novices and veterans alike can practice on controls and sure-kill attacks. This new version comes with animal characters you can control in the new mini games.